I’m going to tell you my theory – if we all disappeared tomorrow and only Michael Happé from Gavox Watches was left on the planet, he’d still be making the same exact timepieces he’s always been making. Because Gavox Watches is the true authentic expression of Michael’s passion for horology, technology, and all things engine-powered. Passion like that will always exist regardless of how you or I feel, because Michael’s ability to express himself isn’t contingent on our presence or feelings. That may sound weird, but I’ve spoken to many brand owners and the majority of them are scrambling around trying to crack the code on what the watchfam wants, so they can design their piece around the audience’s perceived desires. But that’s not what Gavox does. 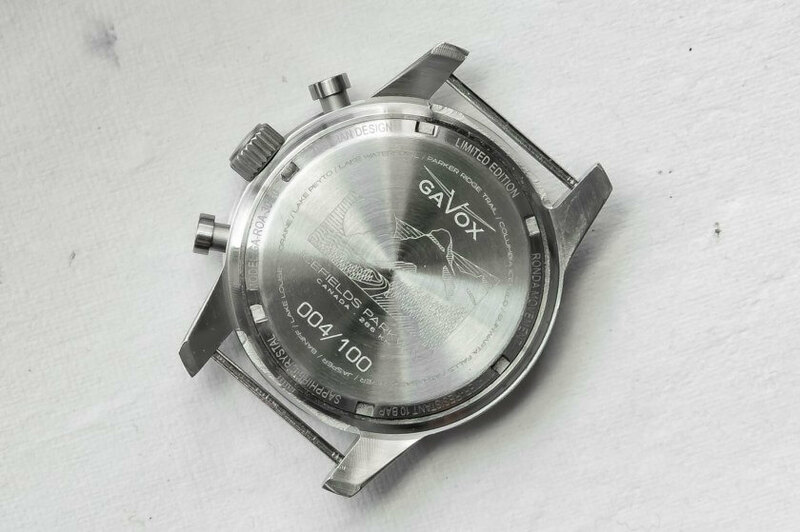 Gavox Watches is one of the only brands that just makes watches the way they want to make them. That usually means a design pespective or narrative that’s special to Michael Happé. The Gavox Watches Limited Edition Roads Chronograph collection is no different. 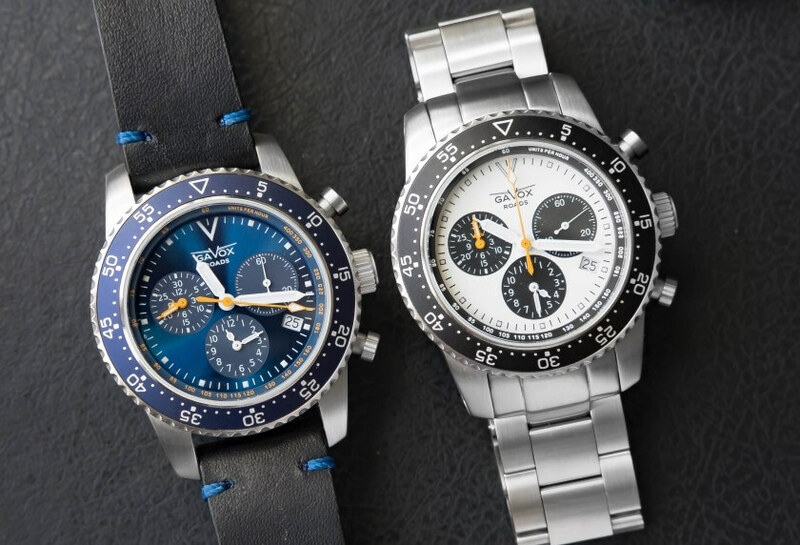 These quartz chronographs come in three varieties representing three iconic long distance, scenic drives. The idea is to evoke the ethos of each drive while also being worn while driving on those roads. Each watch features a roadbook for the long distance drive it’s associated with. Each roadbook features a list of all the places to see and experience on the road. But it’s not a Gavox timepiece unless there’s an element of technological practicality, and that comes from the very unique quartz compilation that’s featured in the Roads. But how does the watch stack up as both a microbrand piece and a purposeful tool that you can rely on? Let’s take a closer look at the Gavox Roads. On first glance the Gavox Roads’ case offers a strong and impactful presence. I mean, it’s just a lot of steel and the weight is definitely there (75g without the bracelet / 164g with the bracelet). Case diameter comes in at about 41mm (without the crown and pushers) with a lug-to-lug distance of about 51mm. On paper the lug-to-lug could seem like the watch would wear large, but I can safely say that it fits perfectly on my 6.75inch wrist (with a small caveat that I’ll mention below). The secret behind this balance of size and comfort comes from the really clever case design. Even though the lug-to-lug span is on the wider side, the actual diameter of the watch really isn’t that bad at 41mm and the actual thickness of the Gavox Chronograph is only about 12mm. This contrast between diameter and span means that the Gavox Roads takes up just the right amount of visual real estate to look bold and substantial without maximizing the actual real estate of your wrist. The entire case features a brushed matte finishing, which is done to very high quality. The visual profile of the case itself is quite classic, which lends itself well to the overall ethos of the watch. 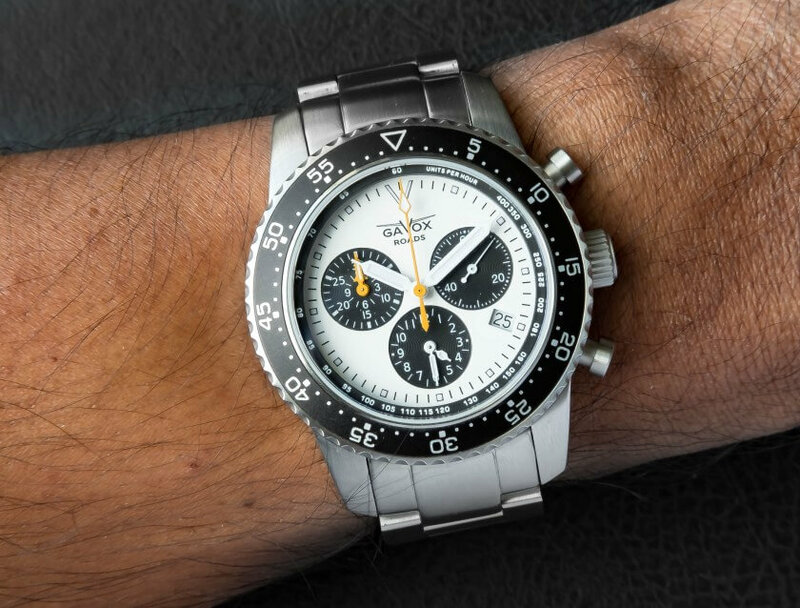 The dive bezel width extends just about a hair beyond the diameter of the case, creating a grip for you to turn the bezel without having the bezel itself overshadow the watch. It’s appears to be an aluminum insert and features 120 very solid clicks. Some people may be a bit confused about the choice of a dive bezel here, and I was too at first. 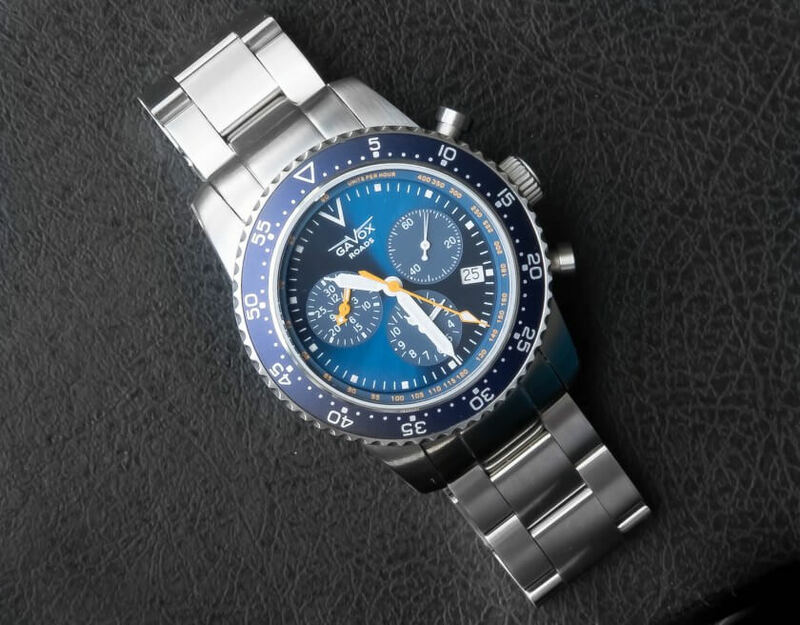 But Michael Happé has stated that he intended for people to dive with this watch if they wished to, which is technically feasible since the crown and case back screw down. The watch is rated for 100 meters of water resistance. Although it should be noted that the bezel doesn’t feature any lume. So if you did try diving with it, timing dives may be tough if visibility gets low. However, I’d be more than confident swimming and snorkeling with this watch on. The 100m WR is just reassurance for you to know it’d be safe in almost every aquatic condition. The lugs are drilled through and feature a cap and screw strap bar. These are really convenient for strap changes since you don’t have to fuss about with a spring bar tool. However, understanding how the cap and screw system works was a bit tricky at first – as I attempted to unscrew the bar, the whole bar would rotate and not allow the actual screw to move. But once I figured out that I had to basically anchor the other end of the bar with my finger, it was fine. I’d rather do that that potentially scratch my watch with a spring bar tool. 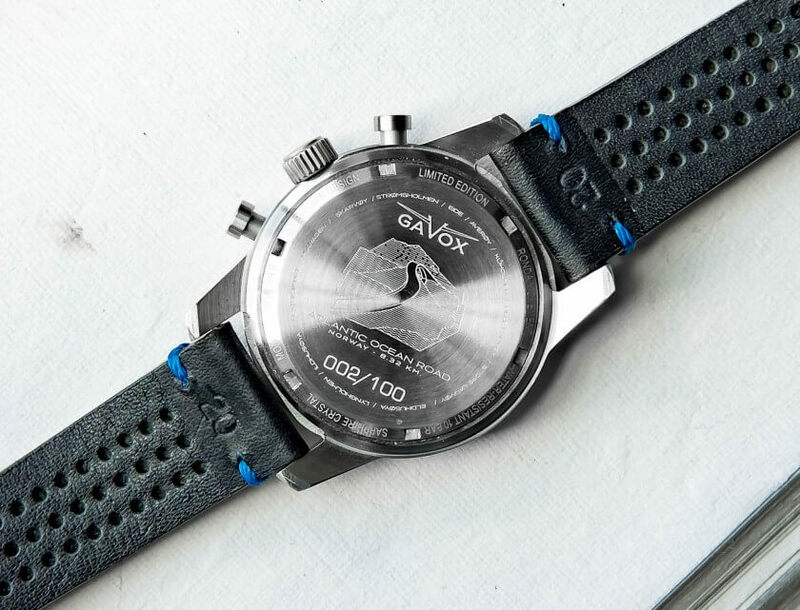 The Gavox Roads features a sapphire crystal and each version of the timepiece features its own unique case back with an engraving depicting an homage to its namesake road. Remember that caveat I mentioned before about the watch being comfortable despite its size? The bracelet is the crux of that caveat (in a good way). The reality is that the Gavox Road’s bracelet acts as an extension of the case, supporting a wearing experience that doesn’t just end at the lugs. Now even though the piece features screw-lugs for easy strap pairings, I’d recommend just keeping the watch on the bracelet. There is a leather strap that’s included with the piece, however I found the bracelet to be far more comfortable and cohesive with the watches design. On the leather, the watch just didn’t sit right on my wrist and I found myself constantly having to adjust it. Much like the case, the bracelet is entirely brushed and finished to an incredibly high degree. You can really feel the quality of the materials and the machining on the links. I’ve had way too many experiences where a bracelet looks substantial and well finished, but as soon as you have it in your hands it feels insubstantial and not of the best quality. That’s not what’s happening here with the Gavox Roads. The bracelet is the backbone of the watch and you can really feel it. The links are classic oyster style, however the bracelet doesn’t taper towards the clasp. It remains a consistent 20mm throughout, which really does wonders for the comfort of the watch in conjunction with the case diameter. The clasp is a classic two-button release with an additional flip-lock mechanism. The joint of the clasp is stamped but also brushed. There are micro-adjustments as well. There was some difficulty in maneuvering the bracelet through the micro-adjustments in that it was a bit stiff to slide around in there. But after a moment or two of shifting it around, the stiffness went away. The included leather strap is of good quality as well. It’s a modern style two-stitch with some additional stitching detail at the ends. Towards the lugs the strap thickness measures in at about 5.5mm and thins to about 3mm towards the end. The spanning-width also tapers towards the buckle from 20mm gradually to about 18mm. The underside of the strap also features venting to help support the breathability of the leather strap. It’s a pretty cool feature actually, especially if you live in humid climates like I do. The dial offers a pleasing contrast to the bold features of the bracelet and case. A series of ticks, hands, markers, and subdials create an intricate but legible dial readout. The effect of combining bold with intricate creates a really purposeful and utilitarian presentation. 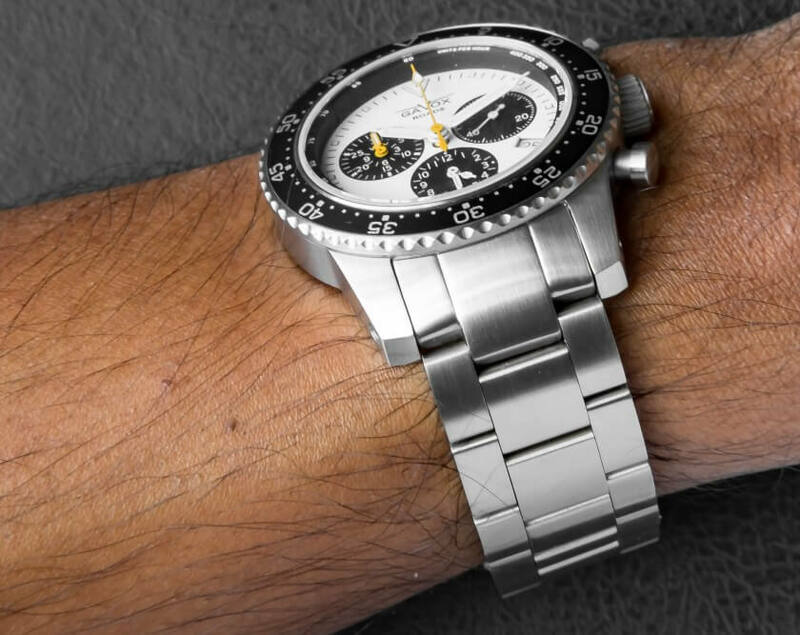 The movement itself is the Ronda 5130D, a 6 Jewel quartz chronograph movement with a date wheel, running seconds, alarm, and double-hand chronograph register measuring 12 hours in 30 minute increments. This isn’t your typical quartz chronograph movement. At 3 O’clock, the running seconds hand continuously runs in real time regardless of whether the chronograph is activated or not. The hand itself is actually quite sleek compared to the other hands – it’s a tail-end lollipop sweep that tapers very slightly towards the tip. The alarm functionality is a lot of fun. You first need to calibrate the alarm readout with the main dial readout. All you have to do is unscrew the crown and then pull it out. This then calibrates the two readouts. Afterwards you use the bottom (B) chrono pusher to move the alarm readout hands to the specified time you want the alarm to go off. Once it’s set you wait for the watch to beep twice. That’s it. Just make sure to screw the crown back in when you’re set. The hands for the alarm subdial are essentially miniature versions of the main dial’s syringe hands and their legibility is very strong. This dial correlates to the time accrued from the chronograph seconds sweep. It’s actually pretty cool. The one subdial has two hands stacked on top of each other. The hand on the top rotates around the dial once every 30 minutes while the hand on the bottom ticks once for every hour that passes. In total it can measure up to 12 hours. The chronograph sweep is a pretty classic looking spear while the 30 minute counter is a syringe hand and the hour counter is an arrow. Although all the hands are different shapes, they’re all the same color. All the hands (except the running seconds hand) are lumed with Superluminova. Plus the classic Gavox “V” at the top and the square ticks on the dial’s outer perimeter are lumed as well. Here’s a video of Michael from Gavox Watches demonstrating how the movement works. In the video he’s using the Gavox Squadron as the example, but both the Roads and the Squadron have the same Ronda movement. If you honestly couldn’t tell, I’m smitten as hell with the Gavox Roads. But I think it goes beyond simply what it is as a timepiece. I’ve always had a love on long distance driving and road trips. There’s just something about being on the road somewhere I’ve never been before that puts me in the moment. I’m more mindful of the present when I’m behind the wheel than almost anywhere else. So as I began to really spend time with the Gavox Roads I started to see how all the different features and design choices started lining up. It’s not just that the watch says “Roads” on the dial or that each dial variety is inspired by a different iconic drive. There’s road trip functionality and practicality built into the piece. Road tripping with multiple people in the same car? You can time your driving shifts with the alarm. Want to make sure you’re making good time between landmarks? Use the chronograph totalizer to track long distances behind the wheel. Hell, get caught in the rain? Or maybe you’re road tripping on the Pacific Coast Highway and you spot the perfect beach? Good thing the Gavox Roads has a screw down crown and 100m of water resistance. It’s one of those things where the watch actually puts me in touch with the possibilities I may encounter on a road trip. It makes me want to road trip! Many of you may be thinking that it’s also possible to do all of these things (minus swimming) with a cell phone. Well you’re right. But I’m road tripping, damnit. The last thing I want to do is stare at my stupid phone. Nothing ruins my cohesion with the moment around me more than staring at my phone. The Gavox Roads is available directly from Gavox at Time2Give for around $400 USD, which is an incredible price for a limited edition timepiece built with such quality and functionality. Only 100 of each model were made and I can’t imagine there are too many left in stock. In fact, mark my words, watchfam. I will somehow purchase the Gavox Roads Blue Dial “Atlantic Road” and visit Norway specifically to drive on that road while wearing this watch. I’m not sure when or how – but one day I’ll make it happen. If you want to learn more about Gavox Watches, Michael Happé was actually a guest on the show back on Episode 41 of the TBWS podcast. Plus, be sure to check out Mike’s review of the Gavox Avidiver.